Here at L & A Martino, we are proud to be leaders in the Geelong concrete industry. From driveways to house slabs to car parks, we understand how concrete works and we’ve seen firsthand what a valuable resource it is in the construction field. Concrete is an excellent material with many advantages. Yet in our work with this substance, we’ve also encountered many of the common myths surrounding it. Today, we’d like to dispel some of those misconceptions, so our customers can have a better grasp of how concrete pouring works as well as an understanding of what concrete elements offer in a residential or commercial setting. While it is true that strong, sturdy concrete can go the distance, it doesn’t thrive without the right approach to maintenance. This is most apparent with well-used elements like concrete flooring. Maintenance is not necessarily extensive with this material, but will depend significantly on the coating or other finish. For basic maintenance or stain removal, you’ll need to use appropriate cleaning materials that are designed to work with concrete. Ideal concrete maintenance will include occasional professional high-pressure cleaning followed by the reapplication of a sealant. With these steps, your concrete building or elements will look beautiful and last for years. Concrete is strong, durable, and often dense, but it is a myth that the material is wholly impermeable. Like other materials, concrete has an element of porosity, allowing vapours or liquids to potentially pass through. To reduce permeability, trust an expert concrete professional. For your concrete requirements in Geelong, Torquay, Leopold, and beyond, L & A Martino are here to assist. The right concrete aggregate can help avoid some permeability, as can special additives, sealants, or other chemical enhancements. With the right approach, the potential for damp damage or shrinkage can be minimised. Worried that you can’t use polished concrete for your commercial flooring? Don’t worry; with the right maintenance steps, your customers won’t be slipping. While polished concrete floors have a beautiful sleek and shiny look, they should not be inherently slippery when dry. In fact, other common floor materials like waxed linoleum actually tend to be more naturally slick. A polished surface of any kind does have the potential to become slippery, however. Minimise this concern by keeping your flooring clean and dry. Stay attentive to the floor’s condition. Check daily for areas of wetness or grease and remedy the problem immediately. You might consider placing rugs on top of highly polished concrete in spots where many pass through regularly. On installation, perhaps you’ll elect to place the polished concrete in smaller, less trafficked areas. 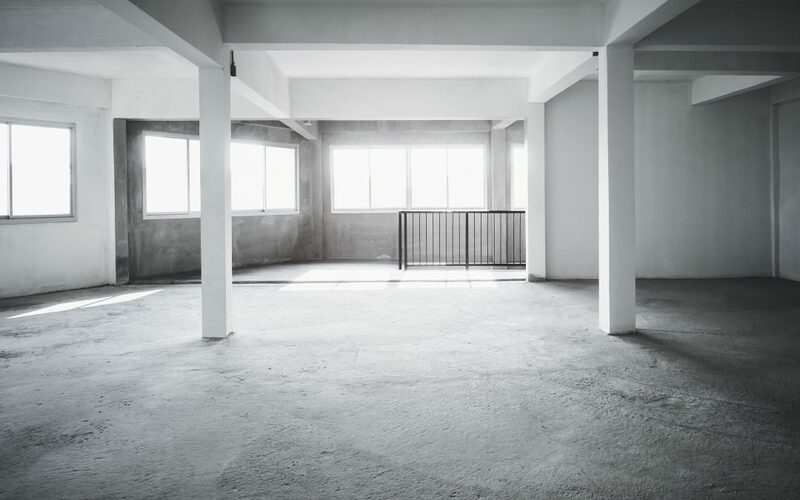 But if your heart is set on polished concrete throughout, the best option is to get your concrete professional to include an anti-slip grit additive to the floor’s finish. This won’t change the look but can help make the surface less slippery. Still another alternative option is aggregate concrete, which looks attractive but has more surface texture and therefore avoids the potential slip factor. There’s an oft-reported myth that many seem to believe regarding concrete’s ability to be customised. Contrary to this belief, concrete comes in far more than grey and white shades and has the potential for excellent customisation options including colour, texture, and finish. If you’re after a certain look, but know that other materials would prove far more costly, chances are, you may be able to achieve a similar style with concrete. Stamping and shaping allows for concrete to resemble stone or tile and colourising options offer limitless possibilities. Want a more cost-effective, durable material that will go the distance? We’d love to chat with you about customising your kitchen bench tops, interior flooring, stairs, ramps, and so much more. Need concreting work in Geelong? You know who to call. L & A Martino are ready to handle your project.